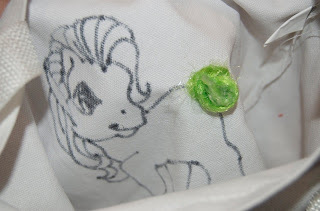 The Singing Momma: DIY My Little Pony Canvas Bags with a 3D Tail! Hey all! 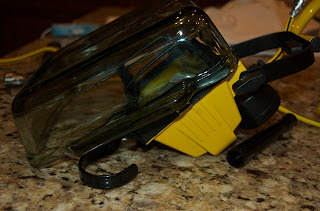 I'm still pretty new to blogging, so please excuse some of the sideways pictures and the lack of all the pics of the "ingredients" before I got started. I'll get better as I do this more! haha! 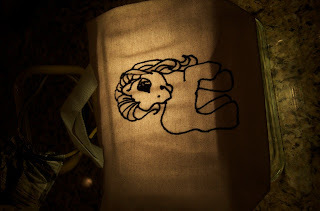 Anyhow, this is how I made over a dozen super cute My Little Pony canvas bags for my niece's guests to paint at her My Little Pony birthday party. Total cost per pre-painted bag, around $1.25, if you already have glue and the main tools. 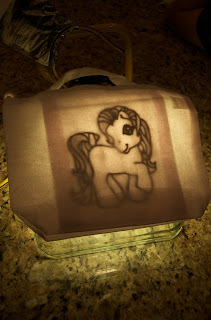 *A light box. If you don't have one, you can probably use a window, but you can also hack something together, like I did below. 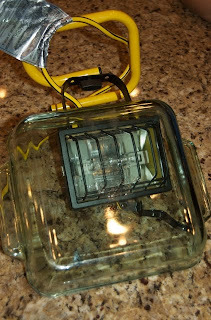 Glass brownie pan + hanging work light = LIGHT BOX! If this were turned the right way, you poor souls wouldn't have a kinked neck. Sorry folks. Here I have finished tracing and have successfully managed NOT to draw in the tail! YAY! 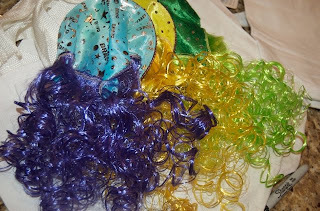 These are the Dollar Tree play wig things I got. 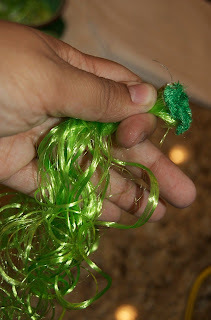 As long as you get colorful curly play hair, you can substitute anything. Then cut off the end bit of material. Here you'll make a small incision (NOT TOO LARGE!) and poke the tail through, starting from the right side and ending on the wrong side. 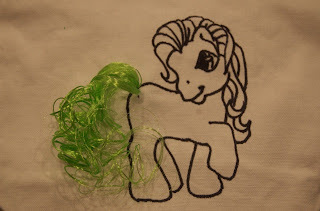 Then tie a knot and glue that little guy in place within an inch of its life! Make sure you're gluing on the inside of the bag at this point! 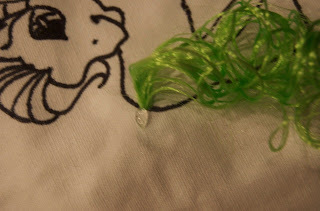 Then, on the outside, place a dab of glue near the tail in the direction you want the tail to go. I wanted a perky tail, so I angled it a little higher than the incision. 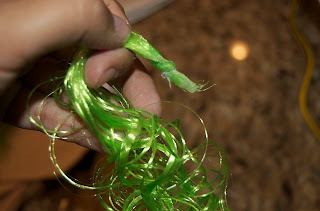 Twist the hair and then press the tail in the glue. Fluff out the tail and voilà! There you are! 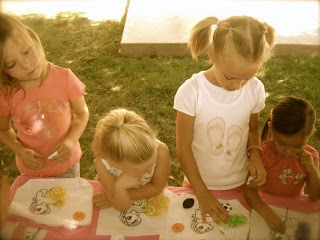 A cute little craft station bag for the girls to paint and decorate! 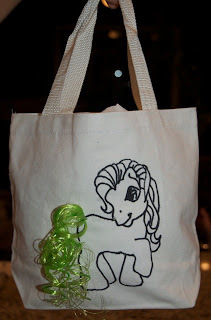 It can also double as a party favor bag! FUN! These were a BIG hit! 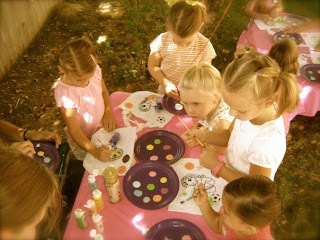 Paint, glitter, sequins and rhinestones go a long way in making little girls happy! 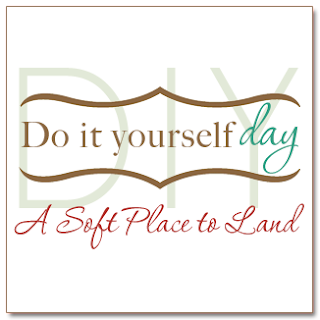 To see more fun DIY projects, follow this link! I LOVE YOUR new PAGE SET UP!!! :) SO COOL!